WYD in Kraków has been started! World Youth Days officially started. The inaugurating Eucharist lasted from 17:30 to 20:30. 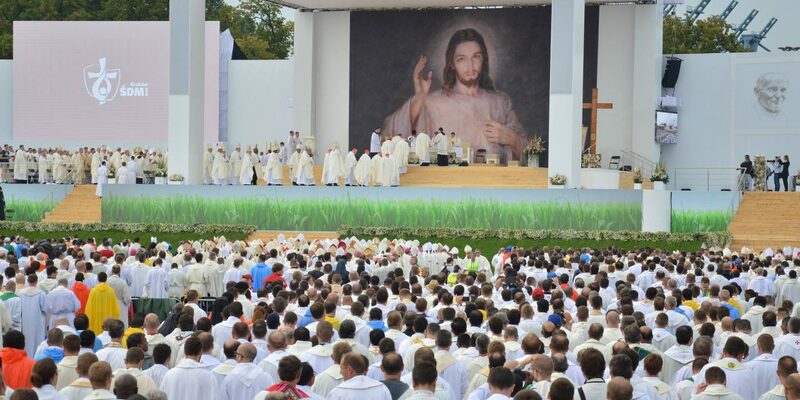 Hundreds of thousands pilgrims heard a homily delivered by a close friend of John Paul II – bishop Dziwisz. The ceremony was adapted to an international audience. The readings were so divided, so that everyone could understand at least some. Content liturgical could be found in prayer books or on the radio – reports Anna Rzeźnik. Mass embellished singing Choir, who performed, among others, “Barka” and “Abba Father”. During the prayer “Our Father” gathered believers were holding hands. – God took care of us – says Malwina Somla, volunteer – before the Eucharist, it was raining, and during the Eucharist the sky was beautiful. Joyful end of the ceremony were dances from Lednica.